Vic Law takes a jump shot. The sophomore forward will look to step up against No. 23 Purdue without Scottie Lindsey in the lineup. On the heels of six-consecutive wins, including a 68-55 victory against Indiana at home Sunday, No. 25 Northwestern is rolling. And if the AP Poll’s recognition is any indication, the country is taking notice. But the Wildcats know success can disappear as quickly as it comes, especially with a marquee matchup at No. 23 Purdue looming Wednesday. The Cats have momentum entering the showdown of ranked teams. During the six-straight victories, NU has seen a career night from sophomore center Dererk Pardon and a superstar performance from junior guard Bryant McIntosh. But Wednesday’s matchup offers a new type of challenge, and might require elite play across the board. Purdue has rolled through the 2016-17 campaign on the shoulders of its frontcourt tandem, featuring sophomore Caleb Swanigan and junior Isaac Haas. Swanigan, averaging over 18 points and 12 rebounds per game, is a Big Ten juggernaut, while the seven-foot-two Haas offers size the Cats simply don’t have in their arsenal. Ahead of the matchup, Pardon is feeling the pressure. He stands at just 6-foot-8 and will face an uphill battle protecting the rim and controlling the glass. Recently, the center struggled against Indiana’s size, falling into early foul trouble and going scoreless. But in the game prior, Pardon exploded for 19 points and 22 rebounds — the kind of performance NU will need from its leader in the post against the Boilermakers. “This is something I’ve just got to take by the horns and just be ready to play,” Pardon said. The Cats will be without junior guard Scottie Lindsey, who will miss the game due to illness. 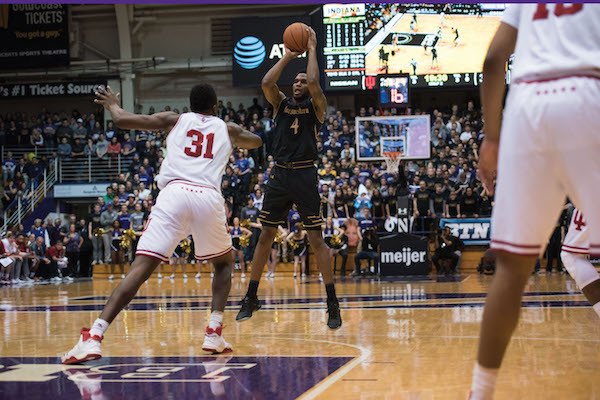 With Law highlighting the need to stretch the floor offensively to compete with Purdue’s size, NU is set for a challenge. But with a prime opportunity to legitimize the recent attention, the Cats are confident in their ability to compete.